Has a 5 year warranty! 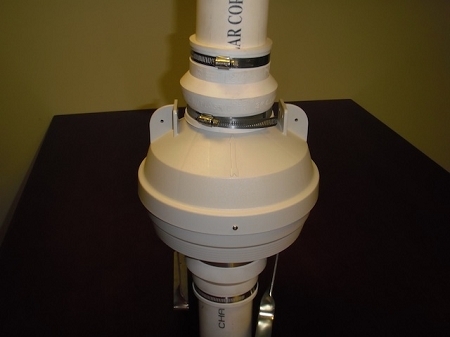 This fan is used to evacuate soil gases like Radon, Methane and other harmful gases emitted from the soil. 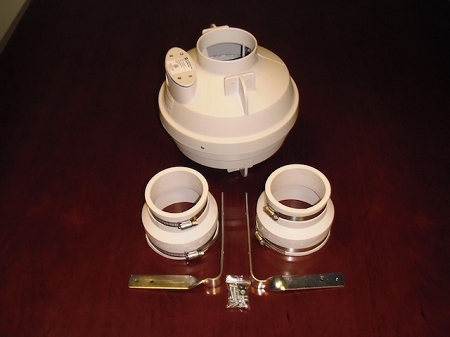 It comes with 3" collars so it can be used with our Instadry Sump Kit™ and Sump Basin. Mitigating soil gases is very important to the health of everyone living in the home. Most soil gases cause a very unpleasant odor even after encapsulation, but Radon does not have an odor and is deadly. Read more about Radon Gas from the EPA. This fan will also help to control moisture in the crawl space by removing it from under the barrier. This method makes a small impact, but is a positive byproduct of its use for soil gas mitigation. I had my crawl space encapsulated a year ago, and several months later I started noticing a strong odor after a hard rain. The odor would work it way through the air vents into the living space. I called Larry after reading his blog on the web, and he suggested this fan. I installed about 65' of thin wall pipe under the plastic on the ground and vented it out of an existing vent. The smell was gone within 12 hours! I also like the fact that it comes with a 5 year warranty. Thanks! Long story, short, but... Following my DIY crawlspace encapsulation job, we started noticing an odor in the house. At first it was just a whiff, but as time went on it got stronger and stronger. Smelled like cat pee and I was wondering if the previous owners had felines in the house. I called Larry at Crawlspace Concepts and he said the culprit was likely soil gas and that I should install a radon mitigation fan and slide a bunch of perforated pipes under my new liner. I took his recommendations, installed the system and within 24 hours the smell was completely gone. With the fan and pipes it was another $350, and I had to pay a roofer $200 to install the vent on our steep roof.